A butterfly walk has been created in Gedling Country Park. It starts near the Spring Lane car park (walk towards the solar farm and the entrance is about 200 yards along on your left going into the woodland that borders Spring Lane). This entrance is marked by white posts and the path runs parallel to Spring Lane and joins the pedestrian entrance footpath running towards Lambley. The path was initially created in Winter 2015, however for its first season, it had a large number of ruts in it and so was not suitable for pushchairs and wheelchairs along many sections. During Spring and Summer 2016, Friends and numerous volunteers worked to level it off and have created some woodland glades and clearings nearby. If you wish for a peaceful few hours sighting insects take a folding chair and sit anywhere along the walk (around where the hard path meets is good) and observe the variety of bees, butterflies, beetles birds and various other wildlife. This includes Roe Deer moving from the Lambley Dumbles into the park and across the walk. Can you identify where? Small Heath - (throughout from post 3 to 11). A butterfly commonly seen between February and October. It is rarely seen at rest. Large White - along the hedgerow of Spring Lane. 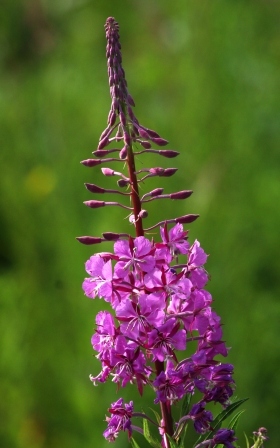 Easily identified and well recognised butterfly from gardens as a serious pest of the cabbage family. Small White - just one flitting along the hedgerow between posts 4 and 7. 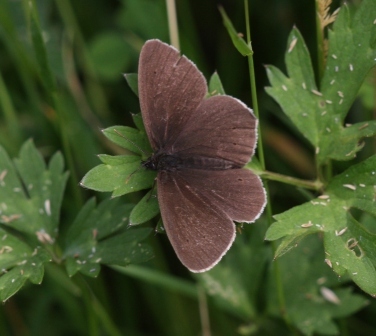 Ringlet - the most common sighting. Dozens are flying all along the walk. A delicate and delightful butterfly. Common Blue - again a few around the all white entrance marker post and post 1. Meadow Brown - a common yet declining species. Viewed throughout the walk. There were also some skippers (probably Small Skipper) flying around posts 7 through to 10. A Cinnabar Moth was sighted around post 6. 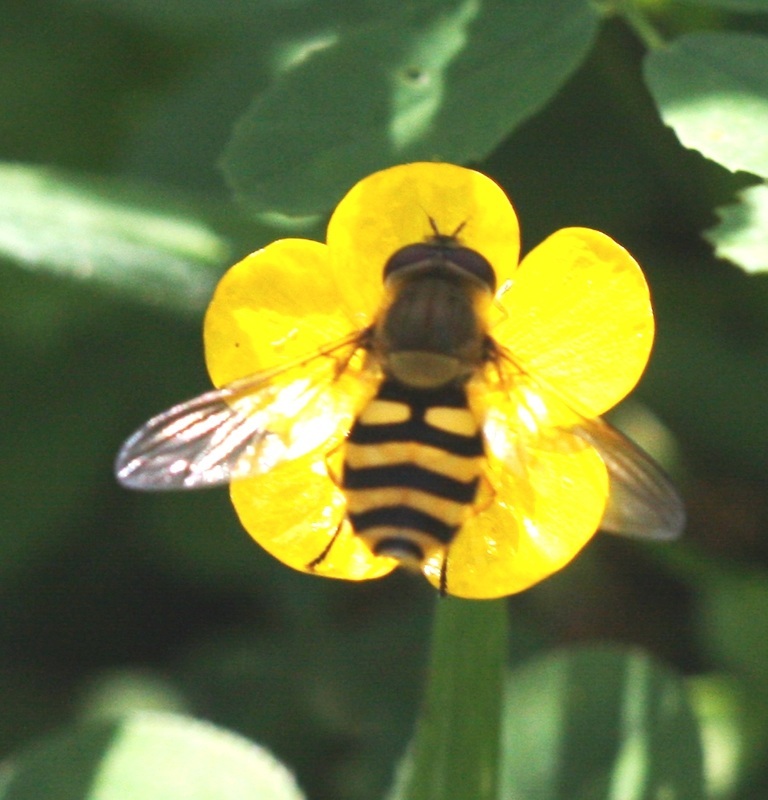 Hoverflies are on the walk in numbers especially one of the Wasp mimics (Eupeodes latifasciatus?). Binoculars and a flask of coffee (or even a picnic) are handy for a long trip. Please do ensure you take some liquid refreshment in the hot weather as well as sun protection. Binoculars, normally associated with bird watching, are ideal for plant and insect spotting as you can cover a large area without moving. 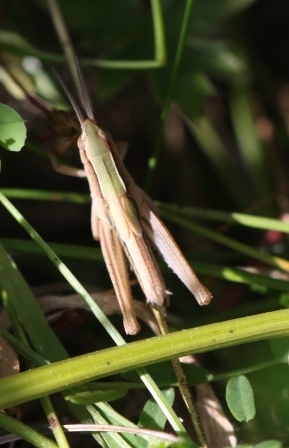 All along the path edges you can observe baby grasshoppers (instars) as they try to hide behind a grass stem and move around it as you change position. Best crouch down to see them as they are very small. Day flying moths are abundant though difficult to identify. 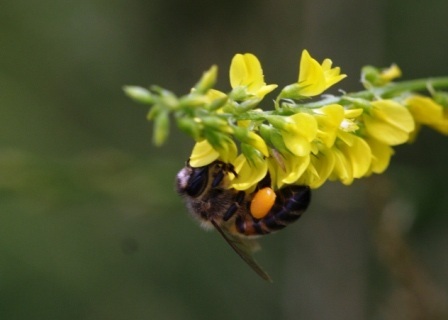 Honeybees are working hard and are numerous. Note their full sacks of pollen. This bodes well for the beehives, which the Friends will be installing in Summer 2015 into the Solar Farm area (following a kind donation from the Foresight Group, the operators of the solar farm). 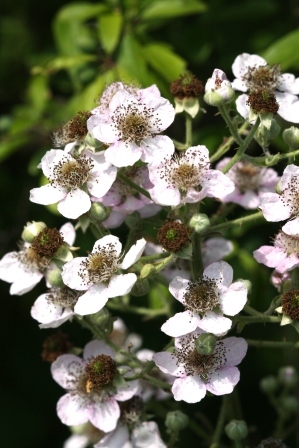 There is plenty of floral interest with various vetches, brambles, thistles and oxeye daisies in full flower. We hope you enjoy your stroll along the butterfly walk and please do report any sightings of interest.